Wedding favours are a gift traditionally given from a bride as a thank-you gift to those invited to attend her wedding day, and which the guests then take home and depending on what the gift is - either eat or keep as a souvenir. Why Does the Bride Give Favours? The tradition of giving wedding favours to guests began in Italy, where they are known as Bomboniere. Italians used delicate fabrics such as lace netting and exquisitely designed boxes to hold 5 sugared almonds that represent health, wealth, happiness, long life and fertility, which the bride then gave to each of her guests to symbolise her thanks to each person chosen to share her special day. A beautiful keepsake of a special occasion, the favours can be chosen to match the wedding theme, colours, flowers or anything you want! You don't have to stick to sugared almonds though. You can choose anything that's relevant to you. Many brides are now concentrating more on how personal and creative the favours are, rather than how much they cost. There are lots of places that specialise in making wedding favours if you want to make a great impression by paying a professional to make them for you. Just go online and take a look at what's available, you won't be short of choice. If you do decide to make your own, then there are a couple of things that you will need to figure out before you go ahead. How long have you got to make the favours? What materials are available to you? What colour scheme/theme do you need to follow? Once you've answered these questions, the rest is up to you. If you're not particularly adventurous, you might want to keep it really simple - which you can do, still keeping the personal touch of making the favours by hand. Somewhere like hobbycraft is a great place to start, and buy some ribbons that match your colour scheme, a length of netting or lace, some elastic bands and some wrapped sweets, sugared almonds or chocolate they can range from quality street to fererro rocher. Place the chocolate in the centre of the netting and gather the edges together, tying in the middle with an elastic band. Then wrap the ribbon around and tie a bow - and hey presto - home made wedding favours. 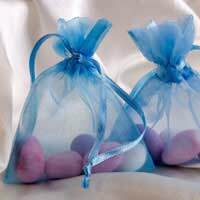 It's even easier if you choose little organza bags with drawstrings - and they look just as good. If you have a special theme for your wedding, then be brave and go with it - if you're a chocolate lover, why not go for a chocolate theme, with a beautifully decorated tiered chocolate fudge cake accompanied by little chocolate heart favours, placed on beautifully decorated tables, each bearing the name of a famous chocolatier. Including a hand-written personal message personal message to each and every person at the reception is a lovely touch, although it may prove to be a little difficult if you have hundreds of people coming along to your wedding party! If time or money is short, keep it simple. You could give favours just to the female guests, or cut back on the cost of the materials you are using to decorate them. If money is really tight, a nice and really inexpensive idea is to make a scroll rather than a gift - Take a sheet of a5 paper and create a pretty heading including your names, wedding date and location. Write or print a poem or message, roll it up and tie it with a ribbon for a simple, yet effective look. Although not inexpensive, a novel slant on this idea is to give each guest a lottery ticket, or a receipt for a charity donation wrapped up and tied in the same way. Whatever favours you choose to make, you do need to be careful with the colour schemes - ivory bags on a white tablecloth (or vice versa) can make the colours look odd or dirty, so make sure you know how the colours will interact with each other before you spend hours making them. If you can't make your mind up, gold and silver are the safest bets to go for - they tend to look stunning whatever the colour scheme.